Katie O’ She Wha’ Nitah was a child who never accepted the reality given to her. She always knew and felt and saw more. As a teenager, She still felt there was more but started to feel and see less even though she still looked beyond the reality given to her “the logical 3D”. She explored past lives, spiritualism via Christianity, Buddhism, Carlos Castenada and many that she do not remember anymore their names but all shaped my life in one form or another. As an adult, Katie put her childish desires aside. Her fears of survival and the perceived need to fit in won out and she became “Normal Logical Katie”. This worked up until the year 2000, and then her world began to turn upside down. She knows now that her world was actually turning right side up for she never did really feel “ok”. Her fear of lack and not having enough and that something bad was going to happen had gotten worse, not better. The illusion of the solid logical 3d reality was beginning to break down. She still held onto it for many years but it no longer had the power she once gave it. Katie’s God Source First Eternal All’ah aya-Self was knocking to come in my 3d “Reality Thought bubble” world. The youth of her childhood, the spark of her Being who chose to co-create with the elements of this beloved Time Space Universe by birthing in. Now, this spark wanted to be fully and completely expressed in this 3d world. The purpose was as a spiritual Being to expand joyfully in this Bio-Spiritual Universe. Some people may use the word “Walk-In” to explain her experience. She will agree with that term as well. No longer do we need to live under the illusion that the 3d world we live in is a finite solid structure. This Conscious Awake Aware Source appears as a flash, in one moment, “a void” of darkness, the next moment within the cave of creation sparkly shiny musical sounds tones of energy that sings and lights up Universes of the human atom. This powerful Source that flows through the Bio-Spiritual realm of Katie has become known to her as O’She Wha’ Nitah. So the harmonizing of the two has brought about Katie O’She Wha’ Nitah. Katie’s joy in life is to keep waking up to who “I Am” as a God Source First Eternal Ah-yah Aya in this Bio-Spiritual Time Space Thought Bubble Reality”. Katie enjoys sharing what she re-members with others to help them re-member who they are. Katie does this through blog posts, stories, literature, videos, techniques and now through her Harmonizing Journey to Re-Alignment Session to support each person to awaken and heal any programs that block re-membering who they are as powerful, joyful creative manifesting God Source 1st Eternal Ah-yah Aya. In Katie’s journey, many friends from other planes of existence continue to give her LUV and support in her waking process. Katie gives much thanks, LUV, and gratitude to the Guardian Alliance/ the Al-Humbhra Magistracy Council of Cosmiyah and Effi’ah. We are Multidimensional Beings living in A Bio-Spiritual Universe. We all have a part of us in these councils offering support and assistance to re-membering in a luving, self-sovereign way who we are. We are all the individuus of the All One. What Katie shares is her own peculiar Template perspective that applies to her own Inner World Journey as IT. Do not take it as absolute Truth but just see where it fits for you in your World where you too are individuus of the All One. You too have your own inner truth of Self that is aching to be joyfully expressed. Katie’s purpose is to be an example of what really the norm is and not what is considered the exception or something “Special”. Seth/ Abraham-Hicks are not just disembodied Spirits. They are expressions of a deeper inner Being of Self for all to express in their own unique way. Katie is the Bio-Spiritual expression manifest in this time-space reality of Katie O’She Wha’Nitah. By bringing together the “Earthly” Katie with the Inner Spirit Being/ Entity essence O’She Wha’Nitah whose name really is a nickname for the Nameless. Clairvoyance is such a funny term to express the expression of one’s authentic expression of Self. All she asks of any reader is to see their own inner Being within her Words. All the Work she does is with this in mind. In July of 2007 when Katie was making her way across the Country, a presence touched her gently within her Being like a sense of awakening with the name O’She Wha’Nitah flowing through her. This experience came after a major 12 Tribes Azurite Press/Now ARhayas Productions workshop. 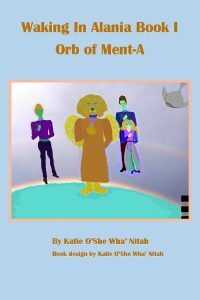 Katie does attribute much of her ease of connection with her Inner Being O’She Wha’ Nitah to her work in Keylontic Science. She advocates for everyone to learn what they can of Keylontic Science particularly those that think of themselves as GridKeepers and GateKeepers. If you do not inner-stand the mechanics of the multidimensional structure (Neural Network Pathways of Mind) of how things work, you are working blindfolded for it is important to honor and use all your senses that as an Entity you created for all your Individuus parts. What does it mean Being in Alignment In Spirit™ or Being in A.I.S. Services? It means to break away from the confines that we have placed on ourselves, in the name of what we think is “Being Human”. Being in A.I.S. Services is about redefining how we see our self, other people and our relationship to the World, Galactic and Universal Reality we truly Live in. No longer can we afford to stay in this Amnesiac State regarding who we are and what we are capable of creating as Powerful God Source First Eternal Beings/ All’ah Ah-yah’ A’ya (You, Me, We, Us, They, IT). Now utilizing Bio-Spiritual Re-Genesis Techniques we can be re-awakened to the Knowledge that: We All Are IT. We are all of equal value. Equal does not mean being the same. We are all unique expressions of Source retaining all attributes of God Source 1st Eternal/All’ah. No longer can we say that we do not have a major effect on creating our relationships, income or lack of and other conditions of the world we perpetually create around our Self. The question remains are we going to continue to play (The Victim) to our own schemes and memes, or are we going to break the cycle and be re-awakened through Self Help Bio-Spiritual Re-Genesis? Being in Alignment In Spirit works with the unique individuus, you, to re-mind you of how to do your own Bio-Spiritual Re-Genesis to Live Hug Now. We do this through stories/varies literature, videos and techniques all designed to focus on your own Self-Empowerment Principles of Awareness. 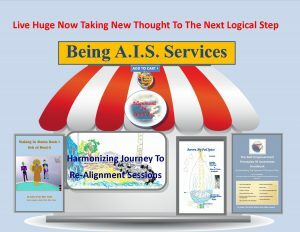 Inspiring and empowering Articles, Videos, Literature and now Harmonizing Journey to Re-Alignment Sessions. These sessions take you back to your innocence of knowing, that free spontaneous self-expression you had as a child. In this space, you connect at a very deep level within your Authentic Multidimensional Beinghood to connect into Aurora New Earth Now. Space is created for clearing and re-aligning your Divine Soul Blue Print back to its Original Reshaic Core Encryption within your Eternal/Internal Core of your Being as the All That Is God Source 1st Eternal Ah-yah A’ya. The Being In Alignment Self Empowerment Principles For Awareness webinar series specifically defined who we are as God Source 1st Eternal and the role 2nd Creation Mechanics has played in us not expressing who we are. 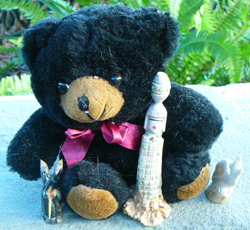 Each Webinar had taken us deeper into the Rabbit hole, where reality is hidden. A variety of resources had been utilized in the making of the webinars but much of the work was taken from Keylontic Science, a branch of The Science of Vibrational Mechanics, presented by E’asha Ashayana of ARhayas Productions (Formerly Azurite Press), Abraham-Hicks, Seth Material(Jane Roberts), I Am Ra: Law of One (Carla Rueckert), Science of Mind (Holmes), In other words “New Thought” at its best. My purpose on this Earth Plane is the transformation of existence as we know it through our personal relationship with the Natural Laws (Elohim) of Mind of the Elemental Kingdom. This knowledge and the awareness that seeps into our Being expands joyfully as we embody who we are as God Source 1st Eternal All’ah Ah-yah’ A’ya (You, Me, We, Us, They, IT) into New Earth plane and beyond. Until one truly gets that “You Create Your Own Reality” by your thoughts, beliefs, expectations, feeling/Elemental Command where all interplay together with probabilities flowing out and through our Bio-Spiritual psyche we will continue to live a Victim/Victimizer World looking outside ourselves for this Savior who will never come or anyone we find will always “fall Short” and there will continually be Wars and strife and struggles over control of finite Net Earth Plane System. For we are IT we are our own Saviors. By establishing the foundation of “The Laws through “The Essence of the Law of One” and “The Waking in Alania Series” I have developed a base framework to view the World. The Self-Empowerment Principles of Awareness(SEPAs) deepen this interplay with such ideas as Seth (Jane Roberts), Abraham-Hicks, Keylonta, Science of Mind and many other “New Thoughters” who are bringing back the fullness of what the Ancient Teachings truly embodied in a way that everyone in today’s world can easily Inner-stand at all levels of their Being. I will continue to develop a deeper inner-standing of how the “Reality Thought Bubble” constructs of our reality evolve and grow. How these Life Codes move through the Neural Network System of the Universal Elemental Kingdom. I will express a deeper meaning of what dimensions are and how different parts of Self all interconnect and affect each other as the true Clan within we are. Through this purpose I am involved in creating a loving, harmonious Self-Empowered Egalitarian Oneness New Earth Plane of the existence of a moneyless system for there is now no need for control of resources for the program of lack is being cleared. Abundance and creativity of life flow will abound as people will continually push beyond the boundaries of reality on the leading edge of Creation. The Mental Controller construct had its purpose in our development but at this point, it has been run into the ground. Enough is enough for me and my peeps. If this sounds like something you want to be a part of in your own expansion and growth, then please support by purchasing our services. Being A.I.S. 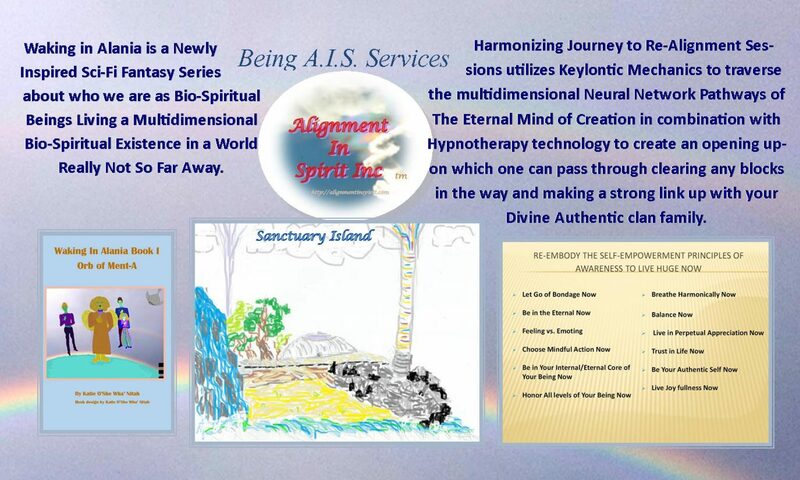 Services is continually evolving to incorporate Practical hands-on techniques in The Self-Empowerment Principles of Awareness Re-Embody The Essence of the Law of One Handbook to practice expressing as the God Source 1st Eternal Ah-yah Ay’a and other material yet to come. Also included is the Series Waking In Alania with background information about the story and characters. A Newly Inspired Sci-Fi Fantasy Series about who we are as Bio-Spiritual Beings Living a Multidimensional Bio-Spiritual Existence in a World Really Not So Far Away. In our distant past (subjective) is a Planet called Tara, an advanced civilization, where people live by the Law of One, they do not eat food to sustain them. However, there is a darkness lurking in the shadows of the Planet’s soul, which has the potential of destroying All Life on Tara. 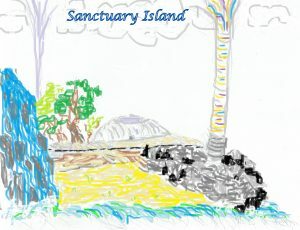 Kara meets up with some unlikely characters from New Guam, an Island located between Alania and the continent of Musa. Musa is the last Planetary Stronghold for those that live by the Law of One. Through her encounter with these powerful people who stand between those who live as Self Sovereigns and those that want to dominate all Life everywhere Kara learns about her own innate power as a Self-Sovereign Being. Can they save Tara? What does Life on Planet Earth hold for them? The story takes place in Modern day Manhattan, NY during the Fall of 2012 when a warehouse in the Garment district blew up. When the explosion occurred, a detective Ben Wilcox aka Genado had been on the scene miraculously survived the blast. Because of the mysterious factors surrounding the case the FBI’s Special Unidentified Phenomenon unit, SUP was brought in whose lead agent was Special Agent Rick Myer aka Eshwa. Candice aka Kara was a reporter assigned to investigate the incident from a very small local Newspaper called Fashion Bug Tales. William Carp aka Prince Caldor appears to Candice as a homeless person only she knows his eyes told her something else. The four of them find out far more than they ever bargained for as the investigation takes them into an ancient portal system where they find themselves meeting up with Melchezedik Ministers, Reptilians, New York’s finest Banshees, The Galactic Federation, and The Dark Time Lords who can take you over from the inside out. They come to discover who and what is The Key as they discover who they really are. Oh, and of course RashalA UR and Guardians are there to help out too. Finally meeting the Ka-Octi-Rhayas who are highly evolved beings from the Central Sun brought in to help as the story culminates in the Land of The Sun and The Moon of Lake Titicaca, Peru. The group is tested once again, only this time, they think they are regular every day Humans. Can they wake up in time to be able to do their jobs as grid keepers before The Dark Time Lords who make the Cabal aka Templar Initiates of The Solar look like sweet little pussycats? The book is in the editing stage as of 2019. All published paperback and ebook products are priced as inexpensively as possible yet still supports the business to continue. Thank you for your LUV and Support.